listen (help·info), and commonly referred to as Chairman Mao (December 26, 1893 – September 9, 1976), was a Chinese communist revolutionary, politician and socio-political theorist. The founding father of the People's Republic of China from its establishment in 1949, he governed the country as Chairman of the Communist Party of China until his death. In this position he converted China into a single-party socialist state, with industry and business being nationalized under state ownership and socialist reforms implemented in all areas of society. Politically a Marxist-Leninist, his theoretical contribution to the ideology along with his military strategies and brand of policies are collectively known as Maoism. Born the son of a wealthy farmer in Shaoshan, Hunan, Mao adopted a Chinese nationalist and anti-imperialist outlook in early life, particularly influenced by the events of the Xinhai Revolution of 1911 and May Fourth Movement of 1919. Coming to adopt Marxism-Leninism while working at Peking University, he became an early member of the Communist Party of China (CPC), soon rising to a senior position. In 1922, the Communists agreed to an alliance with the larger Kuomintang (KMT), a nationalist revolutionary party, whom Mao aided in creating a revolutionary peasant army and organizing rural land reform. In 1927 the KMT's military leader Chiang Kai-shek broke the alliance and set about on an anti-communist purge; in turn, the CPC formed an army of peasant militia, and the two sides clashed in the Chinese Civil War. Mao was responsible for commanding a part of the CPC's Red Army, and after several setbacks, rose to power in the party by leading the Long March. When the Empire of Japan invaded China in 1937, sparking the Second Sino-Japanese War, Mao agreed to a united front with the KMT. From 1941, both sides fought on the side of the Allies of World War II until Victory over Japan was achieved. The civil war then resumed, in which Mao led the Red Army to victory as Chiang and his supporters fled to Taiwan. In 1949 Mao proclaimed the foundation of the People's Republic of China, a one-party socialist state controlled by the Communist Party. After solidifying the reunification of China through his Campaign to Suppress Counterrevolutionaries, Mao enacted sweeping land reform, overthrowing the feudal landlords before seizing their large estates and dividing the land into people's communes. He proceeded to lead a nationwide political campaign known as the Great Leap Forward from 1958 through to 1961, designed to modernize and industrialize the country, however agrarian problems worsened by his policies led to widespread famine. In 1966, he initiated the Cultural Revolution, a program to weed out counter-revolutionary elements in Chinese society, which continued until his death. A deeply controversial figure, Mao is regarded as one of the most important individuals in modern world history. Critics, including many historians, have labeled him a dictator whose administration oversaw systematic human rights abuses, and whose rule is estimated to have caused the deaths of 40–70 million people through starvation, forced labor and executions, ranking his tenure as the top incidence of democide in human history. China's population almost doubled during the period of Mao's leadership, from around 550 to over 900 million. A cult of personality was cultivated around Mao in office. He is still officially held in high regard by the Chinese Communist Party as a great political strategist, military mastermind, and savior of the nation. Maoists furthermore promote his role as a theorist, statesman, poet, and visionary, who has inspired revolutionary movements across the globe. Mao was born on December 26, 1893 in Shaoshanchong village, Shaoshan, Hunan. His father, Mao Yichang, was an impoverished peasant who had become one of the wealthiest farmers in Shaoshan. Zedong described his father as a stern disciplinarian, who would beat him and his three siblings, the boys Zemin and Zetan, and an adopted girl, Zejian. Yichang's wife, Wen Qimei, was a devout Buddhist who tried to temper her husband's strict attitude. Zedong too became a Buddhist, but abandoned this faith in his mid-teenage years. 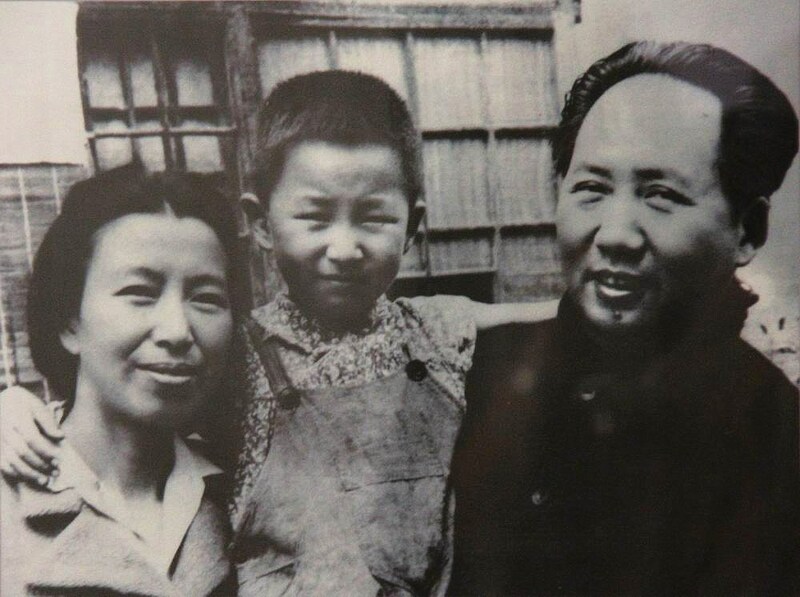 Aged 8, Mao was sent to Shaoshan Primary School. Learning the value systems of Confucianism, he later admitted that he didn't enjoy the classical Chinese texts preaching Confucian morals, instead favoring popular novels like Romance of the Three Kingdoms and Water Margin. Aged 13, Mao finished primary education, and his father had him married to the 17-year-old Luo Yigu, uniting their land-owning families. 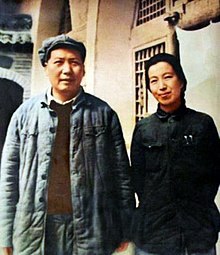 Mao refused to recognize her as his wife, becoming a fierce critic of arranged marriage and temporarily moving away. Luo was locally disgraced and died in 1910. Working on his father's farm, Mao read voraciously, developing a "political consciousness" from Zheng Guanying's booklet which lamented the deterioration of Chinese power and argued for the adoption of representative democracy. Interested in history, Mao was inspired by the military prowess and nationalistic fervour of George Washington and Napoleon Bonaparte. His political views were shaped by Gelaohui-led protests which erupted following a famine in Hunanese capital Changsha; Mao supported the protester's demands, but the armed forces suppressed the dissenters and executed their leaders. The famine spread to Shaoshan, where starving peasants seized his father's grain; disapproving of their actions as morally wrong, Mao nevertheless claimed sympathy for their situation. Aged 16, Mao moved to a higher primary school in nearby Dongshan, where he was bullied for his peasant background. Mao enrolled and dropped out of a police academy, a soap-production school, a law school, an economics school, and the government-run Changsha Middle School. Studying independently, he spent much time in Changsha's library, reading core works of classical liberalism such as Adam Smith's The Wealth of Nations and Montesquieu's The Spirit of the Laws, as well as the works of western scientists and philosophers such as Darwin, Mill, Rousseau, and Spencer. Viewing himself as an intellectual, years later he admitted that at this time he thought himself better than working people. Inspired by Friedrich Paulsen, the liberal emphasis on individualism led Mao to believe that strong individuals were not bound by moral codes but should strive for the greater good; that the end justifies the means. Seeing no use in his son's intellectual pursuits, Mao's father cut off his allowance, forcing him to move into a hostel for the destitute. In his first school year, Mao befriended an older student, Xiao Yu; together they went on a walking tour of Hunan, begging and writing literary couplets to obtain food. 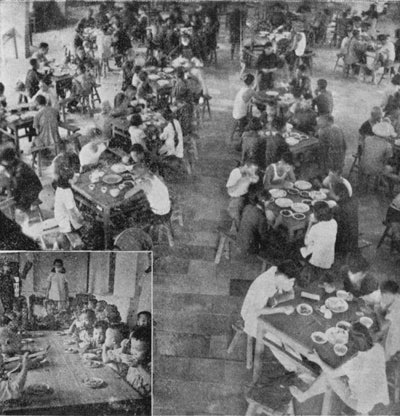 A popular student, in 1915 Mao was elected secretary of the Students Society. Forging an Association for Student Self-Government, he led protests against school rules. In spring 1917, he was elected to command the students' volunteer army, set up to defend the school from marauding soldiers. Increasingly interested in the techniques of war, he took a keen interest in World War I, and also began to develop a sense of solidarity with workers. Mao undertook feats of physical endurance with Xiao Yu and Cai Hesen, and with other young revolutionaries they formed the Renovation of the People Study Society in April 1918 to debate Chen Duxiu's ideas. Desiring personal and societal transformation, the Society gained 70–80 members, many of whom would later join the Communist Party. Mao graduated in June 1919, being ranked third in the year. Mao moved to Beijing, where his mentor Yang Changji had taken a job at Peking University. Yang thought Mao exceptionally "intelligent and handsome", securing him a job as assistant to the university librarian Li Dazhao, an early Chinese communist. Li authored a series of New Youth articles on the October Revolution in Russia, during which the communist Bolshevik Party under the leadership of Vladimir Lenin had seized power. Lenin was an advocate of the socio-political theory of Marxism, first developed by the German sociologists Karl Marx and Friedrich Engels, and Li's articles brought an understanding of Marxism to the Chinese revolutionary movement. Becoming "more and more radical", Mao was influenced by Peter Kropotkin's anarchism but joined Li's Study Group and "developed rapidly toward Marxism" during the winter of 1919. Paid a low wage, Mao lived in a cramped room with seven other Hunanese students, but believed that Beijing's beauty offered "vivid and living compensation". At the university, Mao was widely snubbed due to his rural accent and lowly position. By joining the university's Philosophy and Journalism Societies, he attended lectures and seminars by the likes of Chen Duxiu, Hu Shi, and Qian Xuantong. Mao's time in Beijing ended in the spring of 1919, when he traveled to Shanghai with friends departing for France, before returning to Shaoshan, where his mother was terminally ill; she died in October 1919, with her husband dying in January 1920. China had fallen victim to the expansionist policies of the Empire of Japan, who had conquered large areas of Chinese-controlled territory with the support of France, the UK and the US at the Treaty of Versailles. Under the control of the warlord Duan Qirui, the Chinese Beiyang Government had accepted Japanese dominance, agreeing to their Twenty-One Demands despite popular opposition. 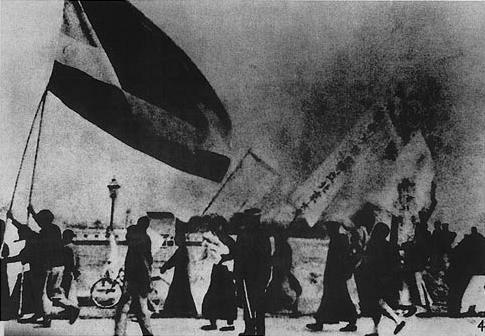 In May 1919, the May Fourth Movement erupted in Beijing, with Chinese patriots rallying against the Japanese and Duan's government. Duan's troops were sent in to crush the protests, but unrest spread throughout China. In Changsha, Mao had gained employment teaching history at the Xiuye Primary School. He began organizing protests against the pro-Duan Governor of Hunan Province, Zhang Jinghui, popularly known as "Zhang the Venomous" due to his criminal activities. In late May, Mao co-founded the Hunanese Student Association with He Shuheng and Deng Zhongxia, organizing a student strike for June and in July 1919 began production of a weekly radical magazine, Xiang River Review (Xiangjiang pinglun). Using vernacular language that would be understandable to the majority of China's populace, he advocated the need for a "Great Union of the Popular Masses", strengthened trade unions able to wage non-violent revolution; his ideas were not Marxist, but heavily influenced by Kropotkin's concept of mutual aid. Zhang banned the Student Association, but Mao continued publishing after assuming editorship of liberal magazine New Hunan (Xin Hunan) and offering articles in popular local newspaper Justice (Ta Kung Po). Several of these articles advocated feminist views, calling for the liberation of women in Chinese society; Mao was influenced by his forced arranged-marriage. In December 1919, Mao helped organize a general strike in Hunan, securing some concessions, but Mao and other student leaders felt threatened by Zhang, and Mao returned to Beijing, visiting the terminally ill Yang Changji. Mao found that his articles had achieved a level of fame among the revolutionary movement, and set about soliciting support in overthrowing Zhang. Coming across newly translated Marxist literature by Thomas Kirkup, Karl Kautsky, and Marx and Engels—notably The Communist Manifesto—he came under their increasing influence, but was still eclectic in his views. Mao visited Tianjin, Jinan, and Qufu, before moving to Shanghai, where he worked as a laundryman and met Chen Duxiu, noting that Chen's adoption of Marxism "deeply impressed me at what was probably a critical period in my life". In Shanghai, Mao met an old teacher of his, Yi Peiji, a revolutionary and member of the Kuomintang (KMT), or Chinese Nationalist Party, which was gaining increasing support and influence. Yi introduced Mao to General Tan Yankai, a senior KMT member who held the loyalty of troops stationed along the Hunanese border with Guangdong. Tan was plotting to overthrow Zhang, and Mao aided him by organizing the Changsha students. In June 1920, Tan led his troops into Changsha, while Zhang fled. In the subsequent reorganization of the provincial administration, Mao was appointed headmaster of the junior section of the First Normal School. Now receiving a large income, he married Yang Kaihui in the winter of 1920. The Communist Party of China was founded by Chen Duxiu and Li Dazhao in the French concession of Shanghai in 1921 as a study society and informal network. Mao set up a Changsha branch, also establishing a branch of the Socialist Youth Corps. Opening a bookstore under the control of his new Cultural Book Society, its purpose was to propagate revolutionary literature throughout Hunan. Helping to organize workers' strikes in the winter of 1920–21, he was involved in the movement for Hunan autonomy, hoping that a Hunanese constitution would increase civil liberties in the province, making his revolutionary activity easier; although the movement was successful, in later life, he denied any involvement. By 1921, small Marxist groups existed in Shanghai, Beijing, Changsha, Wuhan, Canton and Jinan, and it was decided to hold a central meeting, which began in Shanghai on July 23, 1921. The first session of the National Congress of the Communist Party of China was attended by 13 delegates, Mao included, and met in a girls' school that was closed for the summer. After the authorities sent a police spy to the congress, the delegates moved to a boat on South Lake near Chiahsing to escape detection. Although Soviet and Comintern delegates attended, the first congress ignored Lenin's advice to accept a temporary alliance between the communists and the "bourgeois democrats" who also advocated national revolution; instead they stuck to the orthodox Marxist belief that only the urban proletariat could lead a socialist revolution. Now party secretary for Hunan, Mao was stationed in Changsha, from which he went on a Communist recruitment drive. In August 1921, he founded the Self-Study University, through which readers could gain access to revolutionary literature, housed in the premises of the Society for the Study of Wang Fuzhi. Taking part in the YMCA mass education movement to fight illiteracy, he opened a Changsha branch, though replaced the usual textbooks with revolutionary tracts in order to spread Marxism among the students. He continued organizing the labor movement to strike against the administration of Hunan Governor Zhao Hengti, particularly following the execution of two anarchists. In July 1922, the Second Congress of the Communist Party took place in Shanghai, though Mao lost the address and couldn't attend. Adopting Lenin's advice, the delegates agreed to an alliance with the "bourgeois democrats" of the KMT for the good of the "national revolution". Communist Party members joined the KMT, hoping to push its politics leftward. Mao enthusiastically agreed with this decision, arguing for an alliance across China's socio-economic classes; a vocal anti-imperialist, in his writings he lambasted the governments of Japan, UK and US, describing the latter as "the most murderous of hangmen". Mao's strategy for the successful and famous Anyuan coal mines strikes (contrary to later Party historians) depended on both "proletarian" and "bourgeois" strategies. The success depended on innovative organizing by Liu Shaoqi and Li Lisan who not only mobilized the miners, but formed schools and cooperatives. They also engaged local intellectuals, gentry, military officers, merchants, Red Gang dragon heads and church clergy in support. At the Third Congress of the Communist Party in Shanghai in June 1923, the delegates reaffirmed their commitment to working with the KMT against the Beiyang government and imperialists. Supporting this position, Mao was elected to the Party Committee, taking up residence in Shanghai. Attending the First KMT Congress, held in Guangzhou in early 1924, Mao was elected an alternate member of the KMT Central Executive Committee, and put forward four resolutions to decentralize power to urban and rural bureaus. His enthusiastic support for the KMT earned him the suspicion of some communists. In late 1924, Mao returned to Shaoshan to recuperate from an illness. Discovering that the peasantry were increasingly restless due to the upheaval of the past decade, some had seized land from wealthy landowners to found communes; this convinced him of the revolutionary potential of the peasantry, an idea advocated by the KMT but not the communists. As a result, he was appointed to run the KMT's Peasant Movement Training Institute, also becoming Director of its Propaganda Department and editing its Political Weekly (Zhengzhi zhoubao) newsletter. Through the Peasant Movement Training Institute, Mao took an active role in organizing the revolutionary Hunanese peasants and preparing them for militant activity, taking them through military training exercises and getting them to study various left-wing texts. In the winter of 1925, Mao fled to Canton after his revolutionary activities attracted the attention of Zhao's regional authorities. The communists dominated the left wing of the KMT, struggling for power with the party's right wing. When party leader Sun Yat-sen died in May 1925, he was succeeded by a rightist, Chiang Kai-shek, who initiated moves to marginalize the position of the communists. Mao nevertheless supported Chiang's decision to overthrow the Beiyang government and their foreign imperialist allies using the National Revolutionary Army, who embarked on the Northern Expedition in 1926. In the wake of this expedition, peasants rose up, appropriating the land of the wealthy landowners, whom were in many cases killed. Such uprisings angered senior KMT figures, who were themselves landowners, emphasizing the growing class and ideological divide within the revolutionary movement. The CPC continued supporting the Wuhan KMT government, a position Mao initially supported, but he had changed his mind by the time of the CPC's Fifth Congress, deciding to stake all hope on the peasant militia. The question was rendered moot when the Wuhan government expelled all communists from the KMT on 15 July. The CPC founded the Workers' and Peasants' Red Army of China, better known as the "Red Army", to battle Chiang. A battalion led by General Zhu De was ordered to take the city of Nanchang on 1 August 1927 in what became known as the Nanchang Uprising; initially successful, they were forced into retreat after five days, marching south to Shantou, and from there being driven into the wilderness of Fujian. Appointed commander-in-chief of the Red Army, Mao led four regiments against Changsha in the Autumn Harvest Uprising, hoping to spark peasant uprisings across Hunan. On the eve of the attack, Mao composed a poem—the earliest of his to survive—titled "Changsha". His plan was to attack the KMT-held city from three directions on 9 September, but the Fourth Regiment deserted to the KMT cause, attacking the Third Regiment. Mao's army made it to Changsha, but could not take it; by 15 September, he accepted defeat, with 1000 survivors marching east to the Jinggang Mountains of Jiangxi. In their biography of Mao, Mao: the unknown story, Jung Chang and Jon Halliday dispute this version of events. Chang and Halliday claim that the 'uprising' was in fact sabotaged by Mao to allow him to snare a force of Nationalist mutineers from Nanchang who were crossing over to the CCP, prevent them from defecting to any other CCP leader, and enhance his own personal power within the CCP. They claim that Mao's three-day delay in seeing the other leaders of the Hunan uprising, scheduled for 15 August but delayed by Mao until 18 August, was to allow Mao to check that the mutineers would still be passing close by and that if Mao had not had the opportunity of adding this force to his own forces within the CCP he would not have gone to south Hunan. Chang and Halliday allege that Mao later fabricated the version of events (which is still that taught by the CCP) in order to hide the fact that far from leading a peasant uprising, he hijacked it for his own personal ends, sabotaged the organisation, and departed with the new troops before the attack on Changsha had begun. Hiding in Shanghai, the CPC Central Committee expelled Mao from their rank and from the Hunan Provincial Committee, punishment for his "military opportunism", for his focus on rural activity, and for being too lenient with "bad gentry". They nevertheless adopted three policies he had long championed: the immediate formation of soviets, the confiscation of all land without exemption, and the rejection of the KMT. Mao's response was to ignore them. Setting up base in Jinggangshan City, an area of the Jinggang Mountains, Mao united five villages as a self-governing state, supporting the confiscation of land from rich landlords, who were "re-educated" and sometimes executed. He ensured that no massacres took place in the region, pursuing a more lenient approach than that advocated by the Central Committee. Proclaiming that "Even the lame, the deaf and the blind could all come in useful for the revolutionary struggle", he boosted the army's numbers, incorporating two groups of bandits into his army, building a force of around 1,800 troops. He laid down rules for his soldiers: prompt obedience to orders, all confiscations were to be turned over to the government, and nothing was to be confiscated from poorer peasants. In doing so, he molded his men into a disciplined, efficient fighting force. When the enemy avoids a battle, we attack." Mao with his third wife, He Zizhen. In January 1929, Mao and Zhu evacuated the base and took their armies south, to the area around Tonggu and Xinfeng in Jiangxi, which they consolidated as a new base. Together having 2000 men, with a further 800 provided by Peng, the evacuation led to a drop in morale, and many troops became disobedient and began thieving; this worried Li Lisan and the Central Committee, who saw Mao's army as lumpenproletariat unable to share in proletariat class consciousness. In keeping with orthodox Marxist thought, Li believed that only the urban proletariat could lead a successful revolution, and saw little need for Mao's peasant guerrillas; he ordered Mao to disband his army into units to be sent out to spread the revolutionary message. Mao replied that while concurring with Li's theoretical position, he would not disband his army or abandon his base. Both Li and Mao saw the Chinese revolution as the key to world revolution, believing that a CPC victory would spark the overthrow of global imperialism and capitalism. In this, they disagreed with the official line of the Soviet government and Comintern. Officials in Moscow desired greater control over the CPC, removing Li from power by calling him to Russia for an inquest into his errors. They replaced him with Soviet-educated Chinese communists, known as the "28 Bolsheviks", two of whom, Bo Gu and Zhang Wentian, took control of the Central Committee. Mao disagreed with the new leadership, believing they grasped little of the Chinese situation, and soon emerged as their key rival. Attempting to defeat the Communists, the KMT armies adopted a policy of encirclement and annihilation; outnumbered, Mao responded with guerrilla tactics influenced by the works of ancient military strategists like Sun Tzu, but Zhou and the new leadership replaced this approach with a policy of open confrontation and conventional warfare. In doing so the Red Army successfully defeated the first and second encirclements. Angered at his armies' failure, Chiang Kaishek personally arrived to lead the operation; also facing setbacks, he retreated to deal with the further Japanese incursions into China. Victorious, the Red Army expanded its area of control, eventually encompassing a population of 3 million. Mao proceeded with his land reform program, in November 1931 announcing the start of a "land verification project" which was expanded in June 1933, also orchestrating education programs and implementing measures to increase female political participation. Viewing the Communists as a greater threat than the Japanese, Chiang returned to Jiangxi, initiating the fifth encirclement campaign, involving the construction of a concrete and barbed wire "wall of fire" around the state, accompanied by aerial bombardment, to which Zhou's tactics proved ineffective. Trapped inside, morale among the Red Army dropped as food and medicine became scarce, and the leadership decided to evacuate. On 14 October 1934, the Red Army broke through the KMT line on the Jiangxi Soviet's southwest corner at Xinfeng with 85,000 soldiers and 15,000 party cadres and embarked on the "Long March". In order to make the escape, many of the wounded and the ill, as well as women and children, were left behind, defended by a group of guerrilla fighters whom the KMT massacred. The 100,000 who escaped headed to southern Hunan, first crossing the Xiang River after heavy fighting, and then the Wu River, in Guizhou where they took Zunyi in January 1935. Temporarily resting in the city, they held a conference; here, Mao was elected to a position of leadership, becoming Chairman of the Politburo, and de facto leader of both Party and Red Army, in part because his candidacy was supported by Soviet Premier Joseph Stalin. Insisting that they operate as a guerrilla force, he laid out a destination: the Shenshi Soviet in Shaanxi, Northern China, from where the Communists could focus on fighting the Japanese. Mao believed that in focusing on the anti-imperialist struggle, the Communists would earn the trust of the Chinese people, who in turn would renounce the KMT. Many if not most of the events as later described by Mao and which now form the official story of the Communist Party of China, as told above, are seen as outright lies by historians such as Jung Chang. During the decade spent researching the book, Mao: The Unknown Story, for instance, Chang found evidence that there was no battle at Luding and that the CCP crossed the bridge unopposed. Chang interviewed an eye witness to the crossing of the Dadu (Tatu) River at Luding, Mrs Zhu De, then 93 years old, who recalled no deaths, save for two people who fell from the bridge at Luding while repairing it. Chang also points out the contradictions in the version of events as told by the CCP, which said the bridge was taken by a suicide attack by 22 men, but that these men were also present at a ceremony following the crossing of the bridge. Chang and Halliday also dispute the Communist Party of China's official version by claiming that far from the Long March being a masterful piece of strategy by the CCP, it was in fact devised by Chiang Kai Shek, leader of the KMT. Chiang's aim was to give the CCP an easy route to follow through warlord controlled areas. Hemmed in by Nationalist troops on three sides, the CCP was forced to follow the route dictated by the KMT. The aim of this was to allow KMT forces to follow the reds into warlord controlled areas such as Sichuan and win over warlords scared of the sudden arrival of the communist force. The only glitch in this plan came when Mao refused to follow the easy route into Sichuan where he was to meet up with a red army much larger than his own and led by a more senior CCP member, Chang Kuo Tao. Mao recognised the threat Chang posed to his rising position in the CCP and doubled back to give himself time to further cement his political power, causing the needless deaths of thousands of his own troops. Chang and Halliday also point out that Mao and other top CCP leaders did not walk the Long March, but were carried on litters - Mao himself told his staff that being carried on the Long March gave him much time to read - with the litter bearers' knees being worn to the bone when forced to carry Mao up mountains. On the Long March, Mao's wife He Zizen had been injured from a shrapnel wound to the head, and so traveled to Moscow for medical treatment; Mao proceeded to divorce her and marry an actress, Jiang Qing. Mao moved into a cave-house and spent much of his time reading, tending his garden and theorizing. He came to believe that the Red Army alone was unable to defeat the Japanese, and that a Communist-led "government of national defense" should be formed with the KMT and other "bourgeois nationalist" elements to achieve this goal. Although despising Chiang Kai-shek as a "traitor to the nation", on May 5 he telegrammed the Military Council of the Nanking National Government proposing a military alliance, a course of action advocated by Stalin. Although Chiang intended to ignore Mao's message and continue the civil war, he was arrested by one of his own generals, Zhang Xueliang, in Xi'an, leading to the Xi'an Incident; Zhang forced Chiang to discuss the issue with the Communists, resulting in the formation of a United Front with concessions on both sides on December 25, 1937. The Japanese had taken both Shanghai and Nanking—resulting in the Nanking Massacre, an atrocity Mao never spoke of all his life—pushing the Kuomintang government inland to Chungking. The Japanese's brutality led increasing numbers of Chinese joining the fight, with the Red Army growing from 50,000 to 500,000. In August 1938, the Red Army formed the New Fourth Army and the Eighth Route Army, which were nominally under the command of Chiang's National Revolutionary Army. In August 1940, the Red Army initiated the Hundred Regiments Campaign, in which 400,000 troops attacked the Japanese simultaneously in five provinces; a military success, it resulted in the death of 20,000 Japanese, the disruption of railways and the loss of a coal mine. From his base in Yan'an, Mao authored several texts for his troops, including Philosophy of Revolution, which offered an introduction to the Marxist theory of knowledge, Protracted Warfare, which dealt with guerrilla and mobile military tactics, and New Democracy, which laid forward ideas for China's future. In 1948, under direct orders from Mao, the People's Liberation Army starved out the Kuomintang forces occupying the city of Changchun. At least 160,000 civilians are believed to have perished during the siege, which lasted from June until October. PLA lieutenant colonel Zhang Zhenglu, who documented the siege in his book White Snow, Red Blood, compared it to Hiroshima: "The casualties were about the same. Hiroshima took nine seconds; Changchun took five months." On January 21, 1949, Kuomintang forces suffered great losses in battles against Mao's forces. In the early morning of December 10, 1949, PLA troops laid siege to Chengdu, the last KMT-held city in mainland China, and Chiang Kai-shek evacuated from the mainland to Taiwan. The People's Republic of China was established on October 1, 1949. It was the culmination of over two decades of civil and international wars. From 1943 to 1976, Mao was the Chairman of the Communist Party of China. During this period, Mao was called Chairman Mao (毛主席, Máo Zhǔxí) or the Great Leader Chairman Mao (伟大领袖毛主席, Wěidà Lǐngxiù Máo Zhǔxí). Mao famously announced: "The Chinese people have stood up." In October 1950, Mao made the decision to send the People's Volunteer Army into Korea and fight against the United Nations forces led by the U.S. Historical records showed that Mao directed the PVA campaigns in the Korean War to the minute details. Along with land reform, during which significant numbers of landlords and well-to-do peasants were beaten to death at mass meetings organized by the Communist Party as land was taken from them and given to poorer peasants, there was also the Campaign to Suppress Counterrevolutionaries, which involved public executions targeting mainly former Kuomintang officials, businessmen accused of "disturbing" the market, former employees of Western companies and intellectuals whose loyalty was suspect. The U.S. State department in 1976 estimated that there may have been a million killed in the land reform, and 800,000 killed in the counterrevolutionary campaign. Starting in 1951, Mao initiated two successive movements in an effort to rid urban areas of corruption by targeting wealthy capitalists and political opponents, known as the three-anti/five-anti campaigns. While the three-anti campaign was a focused purge of government, industrial and party officials, the five-anti campaign set its sights slightly broader, targeting capitalist elements in general. A climate of raw terror developed as workers denounced their bosses, spouses turned on their spouses, and children informed on their parents; the victims were often humiliated at struggle sessions, a method designed to intimidate and terrify people to the maximum. Mao insisted that minor offenders be criticized and reformed or sent to labor camps, "while the worst among them should be shot." These campaigns took several hundred thousand additional lives, the vast majority via suicide. In Shanghai, suicide by jumping from tall buildings became so commonplace that residents avoided walking on the pavement near skyscrapers for fear that suicides might land on them. Some biographers have pointed out that driving those perceived as enemies to suicide was a common tactic during the Mao-era. For example, in his biography of Mao, Philip Short notes that in the Yan'an Rectification Movement, Mao gave explicit instructions that "no cadre is to be killed," but in practice allowed security chief Kang Sheng to drive opponents to suicide and that "this pattern was repeated throughout his leadership of the People's Republic." Following the consolidation of power, Mao launched the First Five-Year Plan (1953–58). The plan aimed to end Chinese dependence upon agriculture in order to become a world power. With the Soviet Union's assistance, new industrial plants were built and agricultural production eventually fell to a point where industry was beginning to produce enough capital that China no longer needed the USSR's support. The success of the First-Five Year Plan was to encourage Mao to instigate the Second Five-Year Plan, the Great Leap Forward, in 1958. Mao also launched a phase of rapid collectivization. The CPC introduced price controls as well as a Chinese character simplification aimed at increasing literacy. Large-scale industrialization projects were also undertaken. Programs pursued during this time include the Hundred Flowers Campaign, in which Mao indicated his supposed willingness to consider different opinions about how China should be governed. Given the freedom to express themselves, liberal and intellectual Chinese began opposing the Communist Party and questioning its leadership. This was initially tolerated and encouraged. After a few months, Mao's government reversed its policy and persecuted those, totalling perhaps 500,000, who criticized, as well as those who were merely alleged to have criticized, the party in what is called the Anti-Rightist Movement. Authors such as Jung Chang have alleged that the Hundred Flowers Campaign was merely a ruse to root out "dangerous" thinking. In January 1958, Mao Zedong launched the second Five-Year Plan, known as the Great Leap Forward, a plan intended as an alternative model for economic growth to the Soviet model focusing on heavy industry that was advocated by others in the party. Under this economic program, the relatively small agricultural collectives which had been formed to date were rapidly merged into far larger people's communes, and many of the peasants were ordered to work on massive infrastructure projects and on the production of iron and steel. Some private food production was banned; livestock and farm implements were brought under collective ownership. Under the Great Leap Forward, Mao and other party leaders ordered the implementation of a variety of unproven and unscientific new agricultural techniques by the new communes. Combined with the diversion of labor to steel production and infrastructure projects, these projects combined with cyclical natural disasters led to an approximately 15% drop in grain production in 1959 followed by a further 10% decline in 1960 and no recovery in 1961. In an effort to win favor with their superiors and avoid being purged, each layer in the party hierarchy exaggerated the amount of grain produced under them. Based upon the fabricated success, party cadres were ordered to requisition a disproportionately high amount of the true harvest for state use, primarily in the cities and urban areas but also for export. The net result, which was compounded in some areas by drought and in others by floods, left rural peasants with little food for themselves and many millions starved to death in the largest famine known as the Great Chinese Famine. This famine was a direct cause of the death of some 30 million Chinese peasants between 1959 and 1962 and about the same number of births were lost or postponed. Further, many children who became emaciated and malnourished during years of hardship and struggle for survival died shortly after the Great Leap Forward came to an end in 1962. The extent of Mao's knowledge of the severity of the situation has been disputed. Mao's physician believed he may have been unaware about the extent of the famine, partly due to a reluctance to criticize his policies and decisions and the willingness of his staff to exaggerate or outright fake reports regarding food production. Upon finding out the extent of the starvation, Mao vowed to stop eating meat, an action followed by his staff. In Hungry Ghosts, Jasper Becker notes that Mao was dismissive of reports he received of food shortages in the countryside and refused to change course, believing that peasants were lying and that rightists and kulaks were hoarding grain. He refused to open state granaries, and instead launched a series of "anti-grain concealment" drives that resulted in numerous purges and suicides. Other violent campaigns followed in which party leaders went from village to village in search of hidden food reserves, and not only grain, as Mao issued quotas for pigs, chickens, ducks and eggs. Many peasants accused of hiding food were tortured and beaten to death. In contrast, socialist journals such as the Monthly Review have disputed the reliability of the figures commonly cited, the qualitative evidence of a "massive death toll", and Mao's complicity in those deaths which occurred. Whatever the case, the Great Leap Forward caused Mao to lose esteem among many of the top party cadres and was eventually forced to abandon the policy in 1962, while losing some political power to moderate leaders, perhaps most notably Liu Shaoqi and Deng Xiaoping in the process. However, Mao, supported by national propaganda, claimed that he was only partly to blame. As a result, he was able to remain Chairman of the Communist Party, with the Presidency transferred to Liu Shaoqi. "We took all the furniture, pots, and pans we had in our house, and all our neighbors did likewise. We put everything in a big fire and melted down all the metal." At the Lushan Conference in July/August 1959, several leaders expressed concern that the Great Leap Forward had not proved as successful as planned. The most direct of these was Minister of Defence and Korean War General Peng Dehuai. Following Peng's criticism of the Great Leap Forward, Mao orchestrated a purge of Peng and his supporters, stifling criticism of the Great Leap policies. Senior officials who reported the truth of the famine to Mao were branded as "right opportunists." A campaign against right opportunism was launched and resulted in party members and ordinary peasants being sent to camps where many would subsequently die in the famine. Years later the CPC would conclude that 6 million people were wrongly punished in the campaign. The number of deaths by starvation during the Great Leap Forward is deeply controversial. Until the mid-1980s, when official census figures were finally published by the Chinese Government, little was known about the scale of the disaster in the Chinese countryside, as the handful of Western observers allowed access during this time had been restricted to model villages where they were deceived into believing that the Great Leap Forward had been a great success. There was also an assumption that the flow of individual reports of starvation that had been reaching the West, primarily through Hong Kong and Taiwan, must have been localized or exaggerated as China was continuing to claim record harvests and was a net exporter of grain through the period. Because Mao wanted to pay back early to the Soviets debts totaling 1.973 billion yuan from 1960 to 1962, exports increased by 50%, and fellow Communist regimes in North Korea, North Vietnam and Albania were provided grain free of charge. On the international front, the period was dominated by the further isolation of China. The Sino-Soviet split resulted in Nikita Khrushchev's withdrawal of all Soviet technical experts and aid from the country. The split was triggered by arguments over the control and direction of world communism and other disputes pertaining to foreign policy. Most of the problems regarding communist unity resulted from the death of Joseph Stalin in March 1953 and his replacement by Khrushchev. Only Albania under the leadership of Enver Hoxha openly sided with China against the Soviets, which began an alliance between the two countries which would last until the Sino-Albanian split after Mao's death in 1976. Stalin had established himself as the successor of "correct" Marxist thought well before Mao controlled the Communist Party of China, and therefore Mao never challenged the suitability of any Stalinist doctrine (at least while Stalin was alive). Upon the death of Stalin, Mao believed (perhaps because of seniority) that the leadership of the "correct" Marxist doctrine would fall to him. The resulting tension between Khrushchev (at the head of a politically and militarily superior government), and Mao (believing he had a superior understanding of Marxist ideology) eroded the previous patron-client relationship between the Communist Party of the Soviet Union and the CPC. In China, the formerly favorable Soviets were now denounced as "revisionists" and listed alongside "American imperialism" as movements to oppose. At a large Communist Party conference in Beijing in January 1962, called the "Conference of the Seven Thousand," State Chairman Liu Shaoqi denounced the Great Leap Forward as responsible for widespread famine. The overwhelming majority of delegates expressed agreement, but Defense Minister Lin Biao staunchly defended Mao. A brief period of liberalization followed while Mao and Lin plotted a comeback. Liu Shaoqi and Deng Xiaoping rescued the economy by disbanding the people's communes, introducing elements of private control of peasant smallholdings and importing grain from Canada and Australia to mitigate the worst effects of famine. Mao was concerned with the nature of post-1959 China. He saw that the revolution had replaced the old elite with a new one. He was concerned that those in power were becoming estranged from the people they were supposed to serve. Mao believed that a revolution of culture would unseat and unsettle the "ruling class" and keep China in a state of "perpetual revolution" that, theoretically, would serve the interests of the majority, not a tiny elite. Liu Shaoqi and Deng Xiaoping, then the State Chairman and General Secretary, respectively, had favored the idea that Mao should be removed from actual power but maintain his ceremonial and symbolic role, with the party upholding all of his positive contributions to the revolution. They attempted to marginalize Mao by taking control of economic policy and asserting themselves politically as well. Many claim that Mao responded to Liu and Deng's movements by launching the Cultural Revolution in 1966. Some scholars, such as Mobo Gao, claim the case for this is perhaps overstated. Others, such as Frank Dikötter, hold that Mao launched the Cultural Revolution to wreak revenge on those who had dared to challenge him over the Great Leap Forward. Believing that certain liberal bourgeois elements of society continued to threaten the socialist framework, groups of young people known as the Red Guards struggled against authorities at all levels of society and even set up their own tribunals. Chaos reigned in much of the nation, and millions were persecuted, including a famous philosopher, Chen Yuen. During the Cultural Revolution, the schools in China were closed and the young intellectuals living in cities were ordered to the countryside to be "re-educated" by the peasants, where they performed hard manual labor and other work. The Revolution led to the destruction of much of China's traditional cultural heritage and the imprisonment of a huge number of Chinese citizens, as well as creating general economic and social chaos in the country. Millions of lives were ruined during this period, as the Cultural Revolution pierced into every part of Chinese life, depicted by such Chinese films as To Live, The Blue Kite and Farewell My Concubine. It is estimated that hundreds of thousands, perhaps millions, perished in the violence of the Cultural Revolution. When Mao was informed of such losses, particularly that people had been driven to suicide, he is alleged to have commented: "People who try to commit suicide — don't attempt to save them! . . . China is such a populous nation, it is not as if we cannot do without a few people." The authorities allowed the Red Guards to abuse and kill opponents of the regime. Said Xie Fuzhi, national police chief: "Don't say it is wrong of them to beat up bad persons: if in anger they beat someone to death, then so be it." As a result, in August and September 1966, there were 1,772 people murdered in Beijing alone. It was during this period that Mao chose Lin Biao, who seemed to echo all of Mao's ideas, to become his successor. Lin was later officially named as Mao's successor. By 1971, however, a divide between the two men became apparent. Official history in China states that Lin was planning a military coup or an assassination attempt on Mao. Lin Biao died in a plane crash over the air space of Mongolia, presumably on his way to flee China, probably anticipating his arrest. The CPC declared that Lin was planning to depose Mao, and posthumously expelled Lin from the party. At this time, Mao lost trust in many of the top CPC figures. The highest-ranking Soviet Bloc intelligence defector, Lt. Gen. Ion Mihai Pacepa described his conversation with Nicolae Ceauşescu who told him about a plot to kill Mao Zedong with the help of Lin Biao organized by the KGB. In 1969, Mao declared the Cultural Revolution to be over, although the official history of the People's Republic of China marks the end of the Cultural Revolution in 1976 with Mao's death. In the last years of his life, Mao was faced with declining health due to either Parkinson's disease or, according to his physician, amyotrophic lateral sclerosis, as well as lung ailments due to smoking and heart trouble. Some also attributed Mao's decline in health to the betrayal of Lin Biao. Mao remained passive as various factions within the Communist Party mobilized for the power struggle anticipated after his death. This period is often looked at in official circles in China and in the West as a great stagnation or even of reversal for China. While many—an estimated 100 million—did suffer, some scholars, such as Lee Feigon and Mobo Gao, claim there were many great advances, and in some sectors the Chinese economy continued to outperform the west. They hold that the Cultural Revolution period laid the foundation for the spectacular growth that continues in China. During the Cultural Revolution, China exploded its first H-Bomb (1967), launched the Dong Fang Hong satellite (January 30, 1970), commissioned its first nuclear submarines and made various advances in science and technology. Healthcare was free, and living standards in the countryside continued to improve. Mao had been in poor health for several years and had declined visibly for at least six months prior to his death. There are unconfirmed reports that he possibly had ALS. Mao's last public appearance was on May 27, 1976, where he met the visiting Pakistani Prime Minister Zulfikar Ali Bhutto during the latter's one-day visit to Beijing. By late July, Mao had completely dropped out of the public light and was confined to Building 202 located within the Zhongnanhai compound where he spent his last days surrounded by a team of personal doctors. At around 17:00 on September 2, 1976, Mao suffered a heart attack, far more severe than his previous two and affecting a much larger area of his heart. X-rays indicated that his current lung infection had worsened. Mao was alert and fully awake during the crisis and he was said to have kept asking his doctors attending to him if he was in any danger and if he was going to die. Three days later on September 5, Mao's condition was critical. Hua Guofeng called Mao's fourth wife, Jiang Qing, back to Beijing from a trip she was taking of the countryside. She visited him for a short while before returning to her own residence in the Spring Lotus Chamber. On September 7, Mao stopped breathing from a sudden attack of pharyngitis and was barely revived by his doctors who had to perform an emergency tracheostomy to regulate his breathing. The next day, Jiang Qing visited the bedridden Mao again who appeared to recognize her, but could no longer speak and had to communicate with her and his doctors by writing on a notepad. Late in the afternoon, Mao was said to have wrote on his notepad to Jiang: "I feel very ill. Call the doctors." As the doctors were attending to him, Mao suddenly fell into a coma from multiple organ failure and was put on a respirator and life support machines. He was taken off life support shortly before midnight and was pronounced dead ten minutes past midnight on September 9, 1976 at the age of 82. Mao Zedong's embalmed body—draped in the CCP flag—lay in state at the Great Hall of the People for nearly a week, during which many hundreds of thousands of people, including many foreign dignitaries, filed past it to pay their last respects. A massive memorial service was held in and near Tiananmen Square on September 18, 1976. The plaza, decked out with giant portraits of leading socialist figures Karl Marx, Friedrich Engels, Vladimir Lenin and Joseph Stalin, was packed with millions of Chinese in attendance, many of them sobbing visibly. As the clock struck 15:00 local time, a somber cacophony of whistles, guns, horns and sirens were spontaneously blown throughout China as part of a three-minute observance of silence; all those across the country who heard it ceased activity and remained silent as well. When this was over, a band in the square played The Internationale. The memorial was concluded by a 20-minute-long eulogy delivered by Hua Guofeng, who spoke atop Tiananmen Gate. Mao's body was later placed into a large mausoleum, though he had expressed a wish to be cremated and had been one of the first high-ranking officials to sign the "Proposal that all Central Leaders be Cremated after Death" in November 1956. After Mao's death, there was a power struggle for control of China. On one side was the left-wing led by the Gang of Four, who wanted to continue the policy of revolutionary mass mobilization. On the other side was the right-wing opposing these policies. Among the latter group, the right-wing restorationists, led by Chairman Hua Guofeng, advocated a return to central planning along the Soviet model, whereas the right-wing reformers, led by Deng Xiaoping, wanted to overhaul the Chinese economy based on market-oriented policies and to de-emphasize the role of Maoist ideology in determining economic and political policy. Eventually, the reformers won control of the government. Deng Xiaoping, with clear seniority over Hua Guofeng, defeated Hua in a bloodless power struggle four years later in 1980. Mao remains a controversial figure and there is little agreement over his legacy both in China and abroad. Supporters generally credit him with and praised for having unified China and ending the previous decades of civil war. He is also credited with having improved the status of women in China and improving literacy and education. His policies caused the deaths of tens of millions of people during his 27-year reign, more than any other Twentieth Century leader, however supporters point out that in spite of this, life expectancy improved during his reign. His supporters claim that he rapidly industrialized China; however, others have claimed that his policies, particularly the controversially named 'Great Leap Forward' and the Cultural Revolution, were impediments to industrialization and modernization. His supporters claim that his policies laid the groundwork for China's later rise to become an economic superpower, while others claim that his policies delayed economic development and that China's economy only underwent its rapid growth after Mao's policies had been widely abandoned. Mao's revolutionary tactics continue to be used by insurgents, and his political ideology continues to be embraced by many communist organizations around the world. However, Mao has many Chinese critics, both those who live inside and outside China. Opposition to Mao is subject to restriction and censorship in mainland China, but is especially strong elsewhere, where he is often reviled as a brutish ideologue. In the West, his name is generally associated with tyranny and his economic theories widely discredited—though to some political activists he remains a symbol against capitalism, imperialism and western influence. Even in China, key pillars of his economic theory have been largely dismantled by market reformers like Deng Xiaoping and Zhao Ziyang, who succeeded him as leaders of the Communist Party. Though the Chinese Communist Party, which Mao led to power, has rejected in practice the economic fundamentals of much of Mao's ideology, it retains for itself many of the powers established under Mao's reign: it controls the Chinese army, police, courts and media and does not permit multi-party elections at the national or local level, except in Hong Kong. Thus it is difficult to gauge the true extent of support for the Chinese Communist Party and Mao's legacy within mainland China. 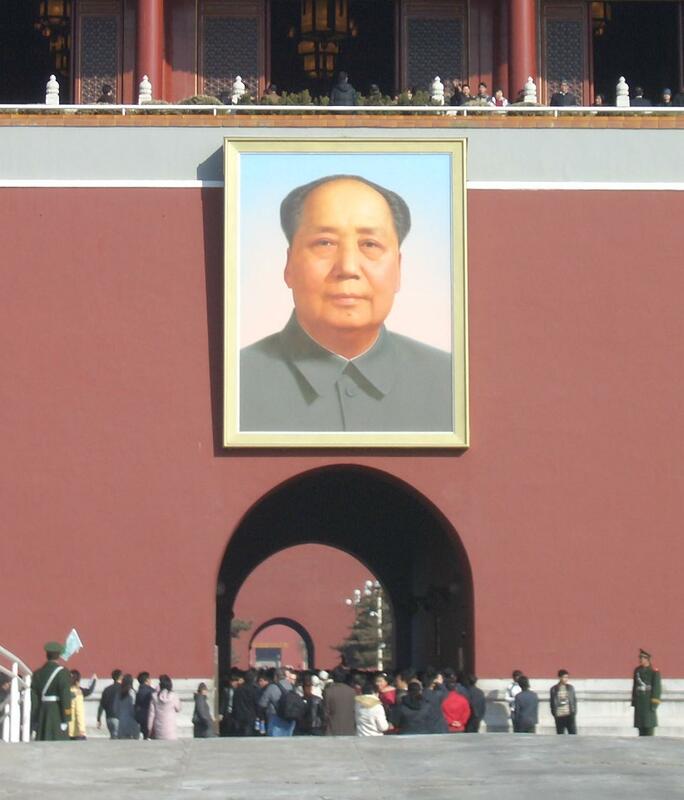 For their part, the Chinese government continues to officially regard Mao as a national hero. In 2008, China opened the Mao Zedong Square to visitors in his hometown of central Hunan Province to mark the 115th anniversary of his birth. Chang and Halliday take literally Mao's penchant for talking about mass death in highly irresponsible, provocative, callous and reckless ways, exemplified by his famous remark that in a nuclear war, half of China's population would perish but the rest would survive and rebuild. In 1958, when ruminating about the dialectics of life and death, he thought that deaths were beneficial, for without them, there could be no renewal. Imagine, he asked, what a disaster it would be if Confucius were still alive. "When people die there ought to be celebrations." In December 1958 he remarked that "destruction (mièwáng 灭亡, also extinction) [of people] has advantages. One can make fertilizer. You say you can't, but actually you can, but you must be spiritually prepared." The authors note that these kinds of remarks could well have justified the indifference of lower-level cadres to peasants deaths. Mao's military writings continue to have a large amount of influence both among those who seek to create an insurgency and those who seek to crush one, especially in manners of guerrilla warfare, at which Mao is popularly regarded as a genius. As an example, the Communist Party of Nepal (Maoist) followed Mao's examples of guerrilla warfare to considerable political and military success even in the 21st century. Mao's major contribution to the military science is his theory of People's War, with not only guerrilla warfare but more importantly, Mobile Warfare methodologies. Mao had successfully applied Mobile Warfare in the Korean War, and was able to encircle, push back and then halt the UN forces in Korea, despite the clear superiority of UN firepower. Mao also gave the impression that he might even welcome a nuclear war. Soviet historians have written that Mao believed his country could survive a nuclear war, even if it lost 300 million people. Mao's poems and writings are frequently cited by both Chinese and non-Chinese. The official Chinese translation of President Barack Obama's inauguration speech used a famous line from one of Mao's poems. John McCain misattributed a campaign quote to Mao several times during his 2008 presidential election bid, saying "Remember the words of Chairman Mao: 'It's always darkest before it's totally black.'" The Revolutionary Communist Party, USA also claims Marxism-Leninism-Maoism as its ideology, as do other Communist Parties around the world which are part of the Revolutionary Internationalist Movement. China itself has moved sharply away from Maoism since Mao's death, and most people outside of China who describe themselves as Maoist regard the Deng Xiaoping reforms to be a betrayal of Maoism, in line with Mao's view of "Capitalist roaders" within the Communist Party. As the Chinese government instituted free market economic reforms starting in the late 1970s and as later Chinese leaders took power, less recognition was given to the status of Mao. This accompanied a decline in state recognition of Mao in later years in contrast to previous years when the state organized numerous events and seminars commemorating Mao's 100th birthday. Nevertheless, the Chinese government has never officially repudiated the tactics of Mao. 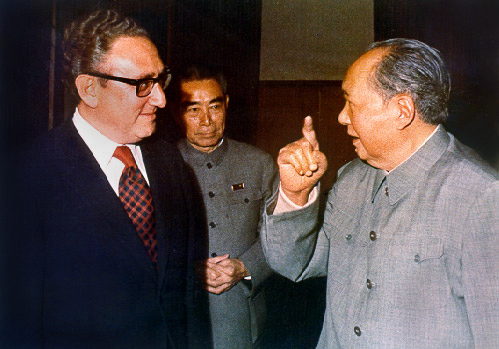 Deng Xiaoping, who was opposed to the Great Leap Forward and the Cultural Revolution, has to a certain extent rejected Mao's legacy, famously saying that Mao was "70% right and 30% wrong". In the mid-1990s, Mao Zedong's picture began to appear on all new renminbi (人民幣) currency from the People's Republic of China. This was officially instituted as an anti-counterfeiting measure as Mao's face is widely recognized in contrast to the generic figures that appear in older currency. On March 13, 2006, a story in the People's Daily reported that a proposal had been made to print the portraits of Sun Yat-sen and Deng Xiaoping. Mao gave contradicting statements on the subject of personality cults. In 1955, as a response to the Khrushchev Report that criticized Joseph Stalin, Mao stated that personality cults are "poisonous ideological survivals of the old society", and reaffirmed China's commitment to collective leadership. But at the 1958 Party congress in Chengdu, Mao expressed support for the personality cults of people whom he labelled as genuinely worthy figures; not those that expressed "blind worship". In 1962, Mao proposed the Socialist Education Movement (SEM) in an attempt to educate the peasants to resist the "temptations" of feudalism and the sprouts of capitalism that he saw re-emerging in the countryside from Liu's economic reforms. Large quantities of politicized art were produced and circulated — with Mao at the center. Numerous posters, badges and musical compositions referenced Mao in the phrase "Chairman Mao is the red sun in our hearts" (毛主席是我们心中的红太阳, Máo Zhǔxí Shì Wǒmen Xīnzhōng De Hóng Tàiyáng) and a "Savior of the people" (人民的大救星, Rénmín De Dà Jiùxīng). In October 1966, Mao's Quotations From Chairman Mao Tse-Tung, which was known as the Little Red Book was published. Party members were encouraged to carry a copy with them and possession was almost mandatory as a criterion for membership. Over the years, Mao's image became displayed almost everywhere, present in homes, offices and shops. His quotations were typographically emphasized by putting them in boldface or red type in even the most obscure writings. 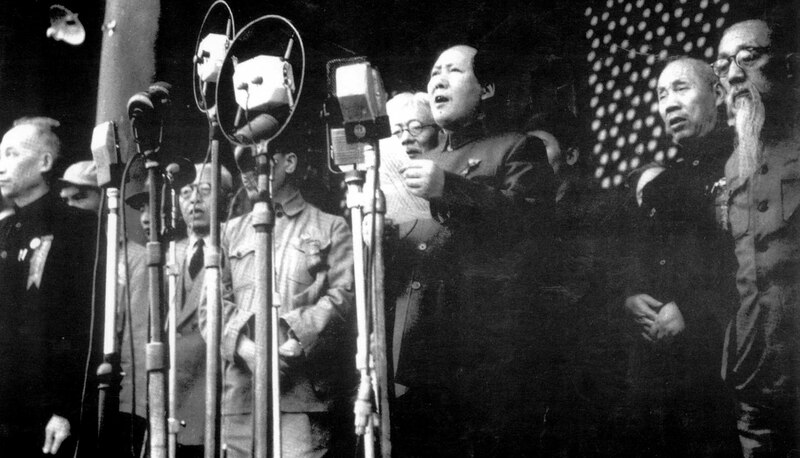 Music from the period emphasized Mao's stature, as did children's rhymes. The phrase "Long Live Chairman Mao for ten thousand years" was commonly heard during the era. A line to enter Mao Zedong Mausoleum. Mao's private life was very secretive at the time of his rule. However, after Mao's death, his personal physician Li Zhisui published The Private Life of Chairman Mao, a memoir which mentions some aspects of Mao's private life, such as chain-smoking cigarettes, rare bathing or dental habits, laziness, addiction to sleeping pills and large number of sexual partners. Having grown up in Hunan, Mao spoke Mandarin with a marked Hunanese accent. Ross Terrill noted Mao was a "son of the soil ... rural and unsophisticated" in origins, while Clare Hollingworth asserted he was proud of his "peasant ways and manners", having a strong Hunanese accent and providing "earthy" comments on sexual matters. Lee Feigon noted that Mao's "earthiness" meant that he remained connected to "everyday Chinese life." Mao's private doctor has reported on his personal hygiene. He never brushed his teeth, preferring to rinse out his mouth with tea and chew the leaves. By the time of his death, his gums were severely infected and his teeth were coated with green film, with several of them coming loose. Rather than bathe, he had a servant rub him down with a hot towel; according to at least one account, he went a quarter-century without taking a bath. Biographer Peter Carter described Mao as having "an attractive personality" who could for much of the time be a "moderate and balanced man", but noted that he could also be ruthless, and showed no mercy to his opponents. This description was echoed by Sinologist Stuart Schram, who emphasized Mao's ruthlessness, but who also noted that he showed no sign of taking pleasure in torture or killing in the revolutionary cause. Lee Feigon considered Mao "draconian and authoritarian" when threatened, but opined that he was not the "kind of villain that his mentor Stalin was". Alexander Pantsov and Steven I. Levine claimed that Mao was a "man of complex moods", who "tried his best to bring about prosperity and gain international respect" for China, being "neither a saint nor a demon." They noted that in early life, he strived to be "a strong, wilful, and purposeful hero, not bound by any moral chains", and that he "passionately desired fame and power". Carter noted that throughout his life, Mao had the ability to gain people's trust, and that as such he gathered around him "an extraordinarily wide range of friends" in his early years. 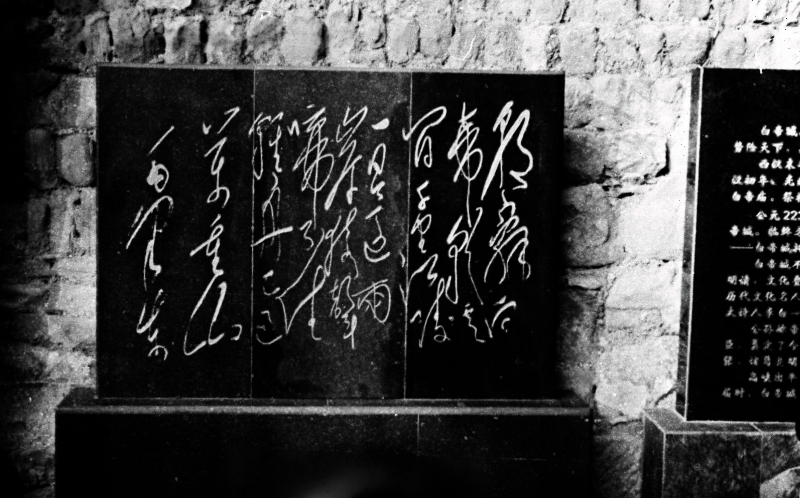 Mao was also a skilled Chinese calligrapher with a highly personal style. In China, Mao was considered a master calligrapher during his lifetime. His calligraphy can be seen today throughout mainland China. His work gave rise to a new form of Chinese calligraphy called "Mao-style" or Maoti, which has gained increasing popularity since his death. There currently exist various competitions specializing in Mao-style calligraphy. 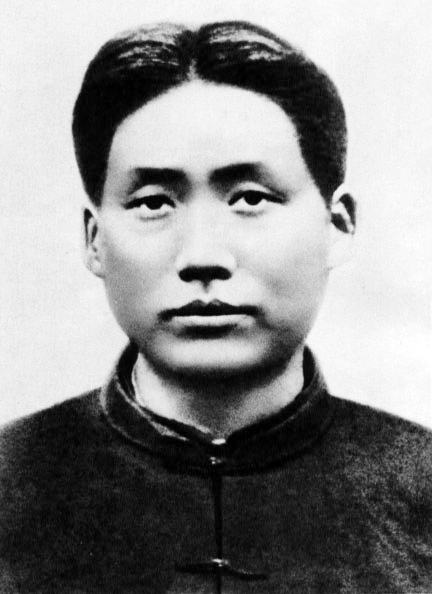 Mao has been portrayed in film and television numerous times. Some notable actors include: Han Shi, the first actor ever to have portrayed Mao, in a 1978 drama Dielianhua and later again in a 1980 film Cross the Dadu River; Gu Yue, who had portrayed Mao 84 times on screen throughout his 27-year career and had won the Best Actor title at the Hundred Flowers Awards in 1990 and 1993; Liu Ye, who played a young Mao in The Founding of a Party (2011); Tang Guoqiang, who has frequently portrayed Mao in more recent times, in the films The Long March (1996) and The Founding of a Republic (2009), and the television series Huang Yanpei (2010), among others. After Mao Zedong won the Chinese civil war in 1949, his goal became to unite the “five races” under the big family, China. Aware of Mao’s vision, the Tibetan government in Lhasa (Tibet) sent a representative, Ngapo Ngawang Jigme to Chamdo, Kham, a strategically high valued town near the border. Ngapo had orders to hold the position while reinforcements was coming from the Lhasa and fight off the Chinese. On October 16, 1950, news came that the PLA was advancing towards Chamdo and had also taken another strategic town named, Riwoche, which could block the route to Lhasa. With new orders, Ngapo and his men retreated to a monastery where the PLA finally surrounded and captured them, though they were treated men with respect. Ngapo wrote to Lhasa suggesting a peaceful surrender or “liberation” instead of war. During the negotiation, the Chinese negotiator laid the cards straight on the table, “It is up to you to choose whether Tibet would be liberated peacefully or by force. It is only matter of sending a telegram to the PLA group to recommence their march to Lhasa.” Ngapo accepted Mao’s “Seventeen-Point Agreement,” which constituted Tibet as part of China, in return for which Tibet would be granted autonomy. In the face of discouraging lack of support from the rest of the world, the Dalai Lama on August 1951, sent a telegram to Mao accepting the Seventeen-Point Agreement. ↑ "Being Mao Zedong". Global Times. 4 July 2011. http://www.china.org.cn/arts/2011-07/04/content_22917108.htm. Retrieved 15 March 2013. ↑ "Famous actor playing Mao Zedong dies". People's Daily. 5 July 2005. http://english.peopledaily.com.cn/200507/05/eng20050705_194191.html. Retrieved 15 March 2013. ↑ "Actor famous for playing Mao Zedong dies of miocardial infarction". People's Daily. 5 July 2005. http://english.peopledaily.com.cn/200507/05/eng20050705_194076.html. Retrieved 15 March 2013. ↑ Liu, Wei (3 June 2011). "The reel Mao". China Daily European Weekly. http://europe.chinadaily.com.cn/epaper/2011-06/03/content_12636667.htm. Retrieved 15 March 2013. ↑ Xiong, Qu (26 November 2011). "Actors expect prosperity of Chinese culture". CCTV News. http://english.cntv.cn/program/cultureexpress/20111126/104783.shtml. Retrieved 15 March 2013. Carter, Peter (1976). Mao. London: Oxford University Press. ISBN 978-0192731401. Davin, Delia (2013). Mao: A Very Short Introduction. Oxford UP. ISBN 9780191654039. http://books.google.com/books?id=GfShg2lD8Y4C. Li, Zhisui (1994). The Private Life of Chairman Mao: The Memoirs of Mao's Personal Physician. London: Random House. ISBN 978-0679764434. MacFarquhar, Roderick; Schoenhals, Michael (2006). Mao's Last Revolution. Cambridge, Massachusetts: Harvard University Press. ISBN 978-0674027480. Schaik, Sam (2011). Tibet A History. New Haven: Yale University Press Publications. ISBN 978-0-300-15404-7. Short, Philip (2001). Mao: A Life. Owl Books. ISBN 978-0-8050-6638-8. http://books.google.com/books?id=4y6mACbLWGsC. Becker, Jasper (1998). Hungry Ghosts: Mao's Secret Famine. Holt Paperbacks. ISBN 0-8050-5668-8. http://books.google.com/books?id=iC4g0gXBmIkC. Valentino, Benjamin A. (2004). Final Solutions: Mass Killing and Genocide in the Twentieth Century. Cornell University Press. ISBN 0-8014-3965-5. http://books.google.com/books?id=LQfeXVU_EvgC. Chirot, Daniel (1996). Modern tyrants: the power and prevalence of evil in our age. Princeton University Press. ISBN 0-691-02777-3. http://books.google.com/books?id=e-kVgozyE8gC. Kuisong, Yang (March 2008). "Reconsidering the Campaign to Suppress Counterrevolutionaries" (PDF). pp. 102–121. http://journals.cambridge.org/production/action/cjoGetFulltext?fulltextid=1809180. "Mao Tse Tung: China's Peasant Emperor". A&E Network. 2005. ASIN B000AABKXG. http://www.imdb.com/video/hulu/vi3081083673/. Retrieved 18 January 2013.